Through its highly perfused tissue, physiological blood flows and pressures, intact gall bladder, and maintained complex cell structure, the BioLiver Platform is the perfect ex vivo liver model to assess acute effects of hepatic devices and therapies. Because liver diseases are one of highest cause of death, LifeTec Group developed the BioLiver Platform to support finding cures and therapies for some of those diseases and help to reduce fatalities and suffering. The effectiveness of hepatic devices and therapies can be assessed visually, hemodynamically, histologically, and metabolically with one experiment by using the BioLiver which is not easily possible during a biopsy or in-vivo studies. 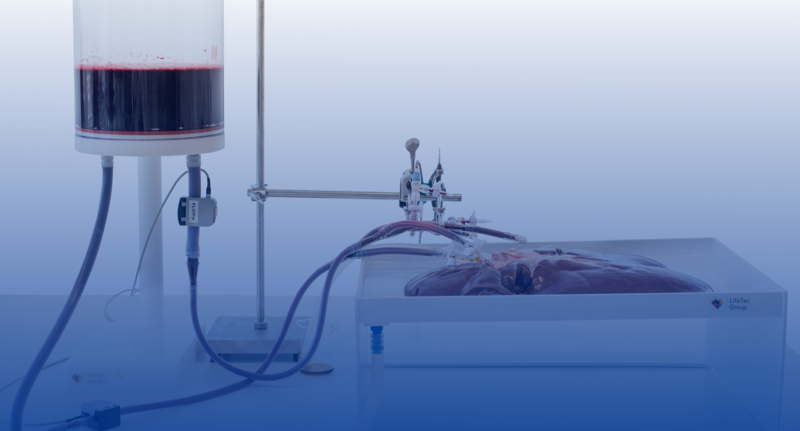 While maintaining the complex cell structure and reducing the animal studies, the BioLiver Platform provides a smart, relevant and efficient preparation for animal and pre-clinical studies. The BioLiver is an alive, functional, and metabolic active ex-vivo liver including the gall bladder. The BioLiver is highly perfused with oxygen and nutrients rich blood with physiological flows and pressures. The realistic physiological hepatic conditions of the BioLiver allows you to asses hepatic metabolism, devices, therapies, and tissue response. In addition, the flexibility of the platform by controlling the perfusion location, temperature, blood pressures and flows together with its compatibility for imaging and continuous hemodynamic monitoring, enables endless research possibilities. LifeTec Group can support you with the design of your experiment to answer your unique research question. Furthermore, the BioLiver Platform allows to assess functionality and feasibility of hepatic surgery devices and procedures and train users in their use. Whether it is for researching, training, testing, or validating hepatic devices, therapies, or metabolism, the 'BioLiver Platform' together with the expertise of LifeTec Group can facilitate them.